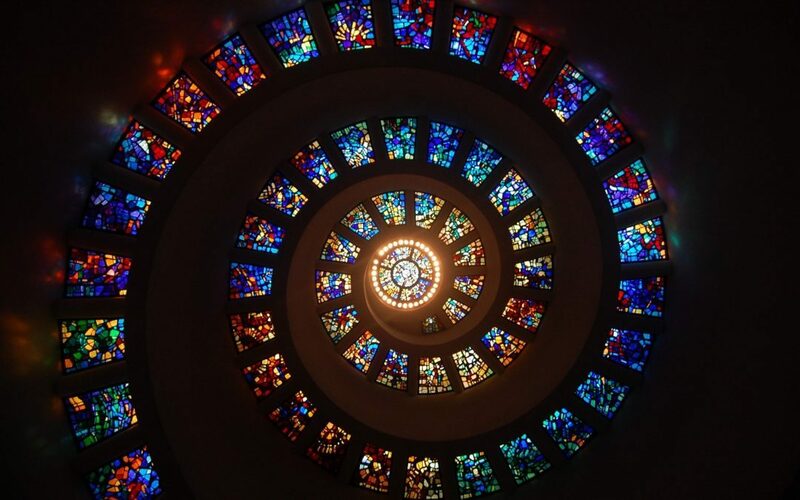 Stained glass is the colourful and vibrant glass structures, popularly found in Middle aged Europe (also known as Medieval Europe) between the 5th and 15th century. In the early middle ages, most buildings were brick heavy with small windows and lots of closed spaces. As architecture developed, this flair was replaced by a new style; Gothic. Gothic architecture saw large stained-glass windows, open planned designs and tall ceilings being incorporated in new plans. Stained glass windows were located predominately in churches and places of worship and served a few purposes. The movement to including stained glass windows in Churches is thought to have been introduced by a French religious leader Abbot Suger. Suger was responsible for the renovation and upgrade of the Abbey Church of Saint Denis located near Paris. He wanted the architecture to be extravagant and reflect religion in the design. There have been heavy connections drawn in religion between light and god. Because of this, a heavenly feel is created when the light peels through the vivacious coloured glass into the large open planned rooms. Secondly, the stained glass was used to depict Christian stories, so religion was accessible to everyone and not limited to only those who could read the bible. During this time, Christian beliefs were heavily engrained in the culture, therefore the images were quite resonant to the people of the time. Today however where Christian beliefs are not as heavily imbedded in modern culture, the pictures portrayed on these stained-glass windows would not be as easily understood. People in medieval Europe had heard the stories repeatedly and in many different forms, so they could therefore make the connections between religious script and pictorial symbolism. The images were not there to educate Christians on the bible, but rather to reflect celebration and prayer to praise God.